Filippo Venditti first came to Painesville, Ohio, between July, 1927, and May, 1930. Filippo, his wife, and children moved to Painesville from West Virginia. In America Filippo Venditti was known Phillip Vendetti. Fillippo moved his family back to West Virginia about 1934. Filippo Venditti, son of Carlo Venditti and Domenica Maselli, was born on July 9, 1893, at Frosolone, Isernia Province, Molise, Italy. He was baptized on July 9, 1893 at Frosolone. Filippo married Filomena Cipriano, daughter of Giuseppe Cipriano, about 1919, at Frosolone. Filippo Venditti died on December 14, 1977, at Clinton, Macomb County, Michigan, at age 84. Filomena Cipriano was born August 14, 1899, at Fairmont, Marion County, West Virginia. Presumably, Filomena’s family returned to Italy sometime before World War I. Filomena Cipriano died on 19 February 1996, at Warren, Macomb County, Michigan at age 96. At the time of her death, Filomena resided in Shelby, Macomb County, Michigan. Filippo Venditti emigrated from Havre, France, on December 21, 1920, aboard the ship SS Canadian Pacific. Filippo, age 27, first immigrated to the United States on January 4, 1921, at Port of Vanceboro, Maine. 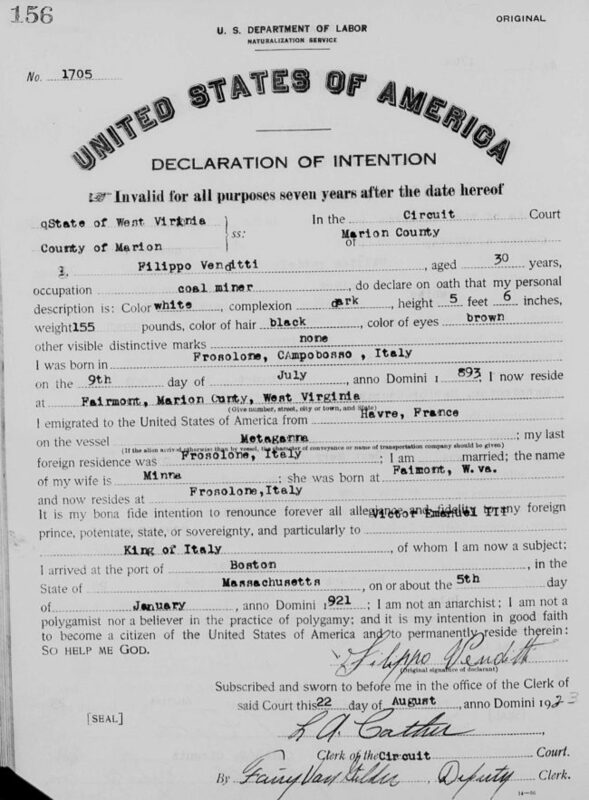 Filippo Venditti declared his intention to become a Citizen of the United States on August 22, 1923, at the Court of Marion County, West Virginia. He resided at Fairmont, West Virginia, at the time. Filippo Venditti became a citizen of the United States in 1927. Filippo was naturalized at the Circuit Court Of McDowell County, Welch, West Virginia. Filomena Cipriano emigrated from Port of Naples, Napoli Province, Campania, Italy, on February 22, 1928, aboard the ship SS Roma. Filomena, age 28, returned to the United States on March 2, 1928, at Port of New York City, New York. She was travelling with her children, Domenica Venditti and Carlo Venditti. Filomena is listed as Filomena Cipriani Venditti on the passenger ship manifest. Filomena Cipriano’s final destination was Myrtland, West Virginia. She was joining her husband, Filippo Venditti. Phillip Venditti was enumerated for the 1930 Census of the United States, on May 6, 1930, living at 252 Sanford Street, Painesville, Lake County, Ohio, as a head of household. According to the 1930 Census, Filiippo was employed as laborer at the Alkali Plant. Filippo’s youngest son, Albert, died in March, 1933, at age 22 months, of pneumonia. Filippo, and his family, moved to Fairmont, Marion County, West Virginia, between 1933 and 1935. Filippo Venditti was enumerated for the 1940 Census of the United States, on April 4, 1940, living at Fairmont, Marion County, West Virginia, as a head of household. Filippo Venditti was enumerated as Philippo Vendetti. At the time of death, Filippo resided at Shelby, Macomb County, Michigan. 1. Domenica Venditti was born on July 7, 1921, at Frosolone, Italy. 2. Carlo Venditti was born May 8, 1926, at Frosolone, Italy. 3. Esther Venditti was born about 1930, at Ohio. 4. Albert Venditti was born on May 30, 1931, at Painesville, Lake County, Ohio. Albert Venditti died on March 4, 1933, at 259 Sanford Street, Painesville, Lake County, Ohio, at age 22 months, of pneumonia. His body was interred at St. Mary Cemetery, Painesville Township, Lake County, Ohio.